No more pulling teeth to get everyone to smile; I work hard to make each session fun and relaxed for everyone attending. If you’re looking to fill your frames with candid, fun, and spontaneous photos that capture the moment, you’ve come to the right place! My editing style is crisp, bright and warm. I strive to keep the integrity of the actual colors of the day while adding a little extra contrast for interest. I love warm creamy lighting with bright skin tones and rich colors. A fast editing turnaround time is essential not only my clients but to my business as well. Along with quick editing I offer customizability with many of my photo sessions to be sure to fit your budget. "Heidi is AMAZING!! Extremely easy to work with, fun personality, great quality pictures and unique to you. I recommend Heidi to everyone near and far needing a photographer. Great prices for even better pictures." "Heidi truly saved the day when I found myself with a very small window of time to get family pictures before our first missionary left. I’m so grateful to have beautiful pictures to remember this moment in our family’s journey. She was absolutely fantastic to work with and completed excellent work in record time. Awesome experience in every way. Thanks so much, Heidi!" "Heidi is a tried-and-true photographer. She’s done photos for my family four different times and I will keep her forever! It’s like that brand of toothpaste you stick to because you know you wont love anything else as much...That’s the case with Heidi—she’s the best! It’s so nice to know that I’m going to get photos I love, which I always do! She’s proven to be quite the talented photographer every time. You can trust her because she has a background in graphic design and has worked in this business for many years. She’s not just one of those photographers who claims to be a professional; she’s very experienced, has all the right equipment, and has excellent personable skills. We love Heidi!!!" 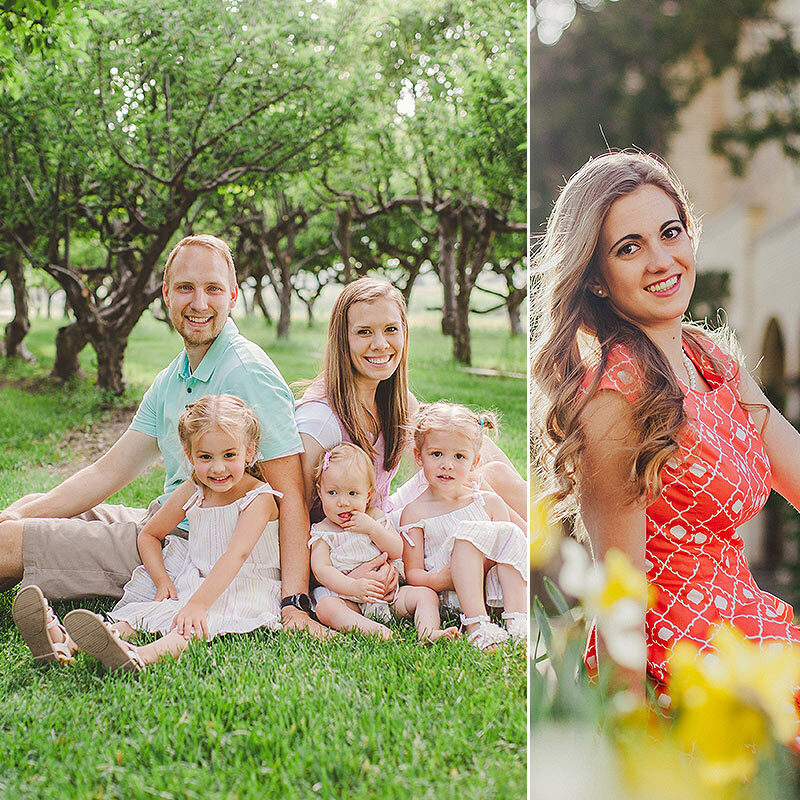 "Our photo experience with Heidi was incredible! Some of our family lives out of state and she was willing and able to squeeze in our family with her busy schedule! Her work turned out beautiful and I couldn’t be happier with the pictures!" "Heidi is FANTASTIC! She is so fun to work with and she takes her work seriously. To her, you are not just another client. She works hard to make your photos beautiful and very special. I love my graduation photos. Thank you, Heidi!" "Heidi was fantastic to work with! She was great with helping my wife and I get the shots that we were hoping for! My wife even brought her horse to take some bridals and Heidi was able to time the pictures well and helped us position the horse and ourselves to get some great shots. Heidi is definitely friendly and fun to work with and does not disappoint in the slightest. I would highly recommend her to anyone!" "Oh where do I even begin to say how awesome Heidi was to work with. She was so amazing. She had to deal with 50 people and 4 generations. So you can imagine the amount of personalities oozing from our group! She came to our family reunion and did wonders. The pictures turned out gorgeous and she had them back to us so fast. Thank you so much for your help in organizing this once in a lifetime opportunity for our family! We will truly cherish these pictures forever." "Heidi recently took photos for me and I was really impressed with her skill and professionalism. I am not comfortable in front of a camera but Heidi managed to get some great photos of me anyways. She delivered the photos to me in a timely manner, with lots of great, edited shots to choose from. Would highly recommend Heidi Randall Studios! Thanks Heidi!" "Heidi was great! She was able to fit us in last minute and the entire process was easy and enjoyable. Our pictures turned out great and I am extremely happy." "Every time I have Heidi as my photographer I am blown away by her skills. She has a way of capturing exactly what I envisioned. You can’t go wrong when hiring Heidi Randall Studios for any type of photography or design." "Our family photos weren’t the easiest to do. With a toddler, an infant and two crazy dogs, Heidi met the challenge. She was able to capture all our personalities and did an exceptional job! I highly recommend her and her work!" "I truly had a wonderful experience. I worked with Heidi on some product advertising and was really pleased. She is really good at posing, positioning for the best shots, has a really good eye for locations, and is fun to work with. I will definitely work with her in the future on projects. Thank you Heidi!" "First I would like to say, thank you for fitting my family in with the short notice and working with just the couple days I had in town. You’ve been so great to us and been prompt with your words also your work! I’m so happy I have found you, you had made us feel so comfortable, working with us probably wasn’t the easiest yet you made it happen! We sure didn’t know what we was doing or even how to pose. You taking control and giving us that push and giving us direction made it easier for all of us. We had fun, I’m glad you picked the location it was perfect! Not only do I have amazing family pictures I made a friend out of this short family photo shoot. Thank you again for having us. I look forward working with you again!" We are giddy with the results! "Wow, just wow! Heidi is very talented at what she does. We had a last minute location change due to a canyon close and she easily kicked into gear and suggested a beautiful new setting. We got a little lost on the way too, but she was patient and didn’t rush the shoot even though we were late getting started. They turned out great and her turnaround was SO FAST. It was two days later with a Sunday in between. She went above and beyond and we are giddy with the results. Thank you, Heidi!" "Couldn’t ask for a better photographer! Heidi is super knowledgeable and full of great ideas!" fine Art prints make wonderful gifts!